This is the first time I’ve given Resident Evil 2 a try since I don’t happen to be a major fan of Resident Evil. Nonetheless, I do enjoy the series and I figured while I was waiting for other games, it was a good time to give the new RE2 demo a try. I haven’t actually seriously gotten into these games before outside of Resident Evil 0. 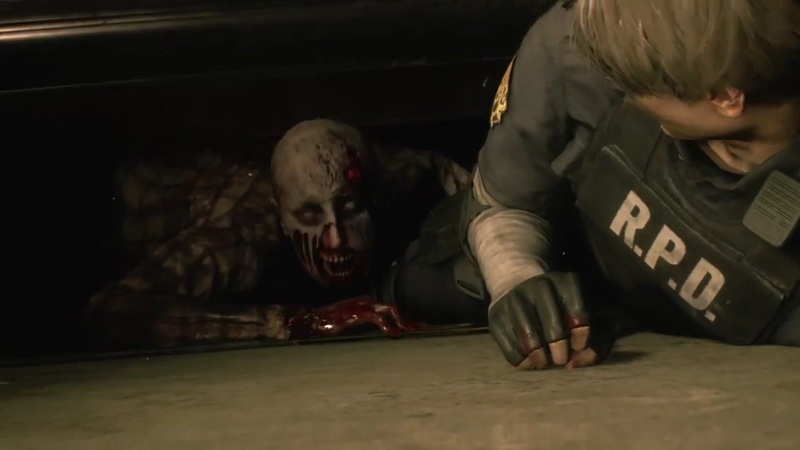 I like RE0’s more creepy, jump scare style. I wasn’t a fan of the elements introduced in Resident Evil 4 that made it more like a survival shooter, pitting you against ridiculously large hordes of enemies. Plus, it’s not a series I have any skill for and I’ve found that the prequel is the easiest entry to get into. These first impressions are from the perspective of someone less familiar with the series who went into it completely blind. Despite usually having trouble with this type of game, I did manage to get through the demo and make full use of the thirty minute time limit. The first thing I noticed while playing was the environment. Knowing that this title was originally on various old consoles like the Nintendo 64 and PS1, I imagine it’s a huge upgrade from how the game once looked back in the day. I appreciated the new details, from the shiny entrance hallway floors to all of the smaller details in more crowded and close quarter hallways. There was plenty of blood splattering where you would expect and chairs and desks piled up blocking portions of hallways. In addition to that were other traces of both the horror of what might’ve occurred there, to survivors trying to keep themselves secluded and safe for however long they could. Modern games truly are wonderful in the way they can do these kinds of things. Another aspect of the game that stuck out to me, one that I usually notice and talk about when writing about games I play, is the atmosphere. Every game has its own unique atmosphere whether it’s executed well or not. 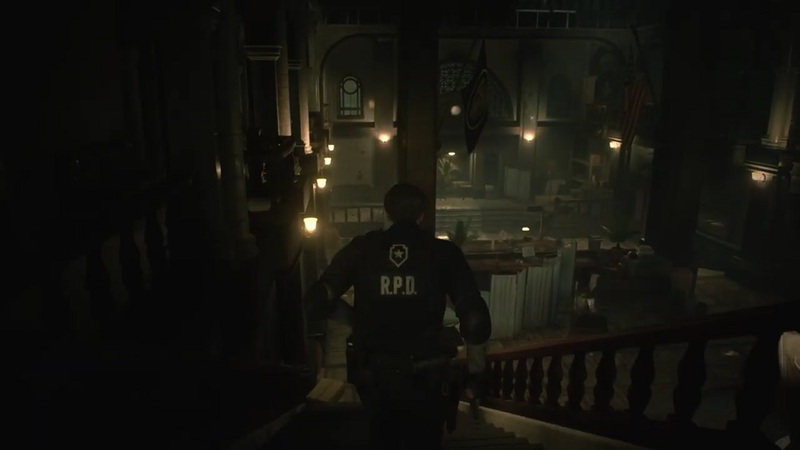 But let me tell you, I think Resident Evil does a good job with the atmosphere and it seems like that’s especially so in these much updated remakes. There are more sounds and whatnot surrounding you than overly present music and that’s how it should be done with this series. In a horror game like this, it’s good to be able to hear everything and pay close attention to what’s going on around you. There was appropriate wind noise near damaged windows and at one point I heard a voice coming through a dead officer’s walkie talkie in a hallway. All of these atmospheric details add to the overall creepiness and uneasiness you feel while playing. Sometimes, I almost get too freaked out playing games like this, but that’s how it should be. From what I did play of Resident Evil 4 years ago, I was not a fan of the out in the open, survival theme with huge mobs of enemies. I prefer slowly sneaking around and keeping a careful watch on my surroundings to make sure there isn’t a stray zombie or two about to get me. And while I’m on the topic of keeping an eye on my surroundings, that’s also a nice touch with any Resident Evil game I play. It’s nice how it’s realistic in that you might see some dead bodies as you’re exploring, yet possibly twenty or so minutes later, you’ll notice that body is missing and then you know you have to be especially careful, because they’re very likely around the corner. The dead bodies remind me of my only complaint with the game so far. Some of the physics behind how some of the dead bodies and zombies flop around isn’t as realistic as it could be. They seem too loose and floppy compared to how I feel like they realistically should be. Finally the only other thing I can think of to discuss from my experience with this demo is how the controls felt. The controls were very good and not hard at all to get used to. 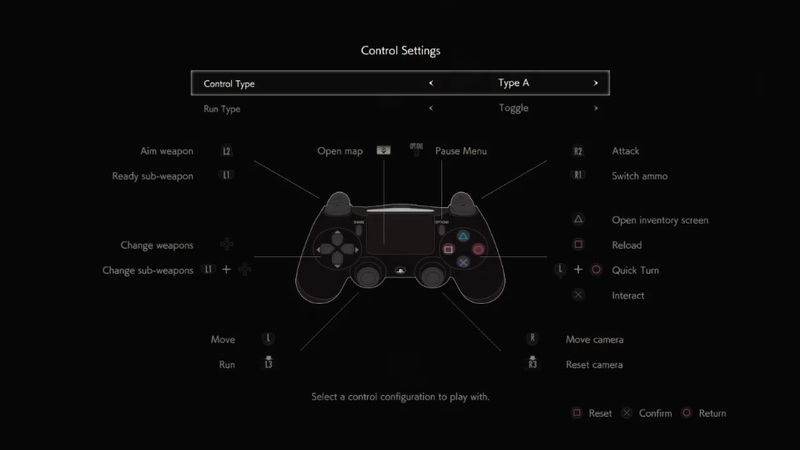 I stuck with the “Type A” control scheme and otherwise only switched the cameras and aiming to inverted while I was in the settings menu. I didn’t find a reason to change up any other controls. The triggers that are set by default to aiming and shooting are perfect. Not to mention, it was a nice touch being able to see better in dark hallways if I crept through them slowly with the gun aimed. This made it somewhat more of a first person-esque viewpoint and spread out the range of your flashlight. It helped brighten up the hallways more and kept me ready if anything popped out in front. Oh and you can definitely tell they’ve been making the walking and running around in Resident Evil smoother in newer, more recent games. 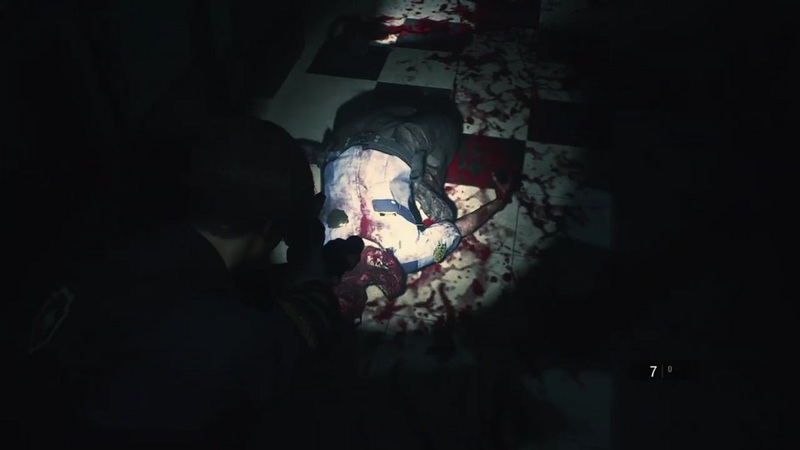 Back when I played RE0 it was quite a bit clunkier and took some time to move around small areas and get a good idea of all that was around me. Taking everything into account from my experience with this short demo, it looks like it should be a fantastic game. The controls are smooth and fluid, the atmosphere given off fits everything as it should and it’s enjoyable exploring the building you’re in, seeing various left behind objects, debris and damage surrounding you. As I said earlier, while I haven’t seen or played much of the older games, I don’t believe they would have been able to create such tragic scenes as this nearly as well. Modern games are able to add a lot more detail to their scenery. But seeing as I personally am not skilled at this type of game whatsoever, I can’t see myself paying full price for this. I may pick it up one day in the future though when there’s a great sale or the price has been chopped significantly. 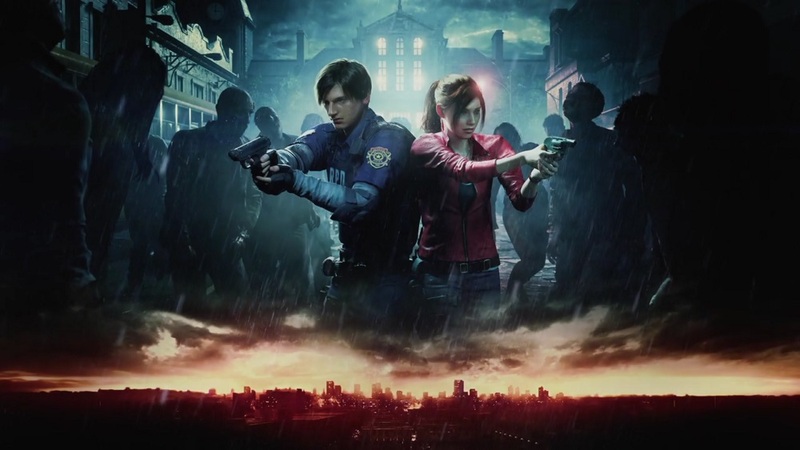 For anyone who is a fan though, so far I believe the Resident Evil 2 remake looks awesome and I bet it will be a fun time for anyone who’s into these types of games.